This mod re-balances Skyrim's stealth skills (Sneak, Lockpicking, and Pickpocket) to add greater challenge and immersion to the game. If you play a stealth-based character, this mod will make your game more difficult but also much more rewarding. theincrediblenick for the fingerless gauntlet meshes. Grace Darkling for the screenshot used in the title image. Mitchalek for creating the scripts that were used as the basis for developing the script allowing customization of the Camouflage perk. Included updated script for Camouflaged perk. Changed two of the Muffle enchantments from Restoration School to NONE. Added option to apply gauntlet penalty to only those items that cover the entire hand (see readme). Incorporated two changes from USKP that I had previously missed and were getting overwritten. New alternate option for All Access, a once-per-day unlock power (see readme). Adjusted the installation script to check whether the mod is being installed with a new or existing game. Added several variables that can be used to customize the mod by disabling certain features. Small correction to the Golden Hands perk. Updated clothing and armor to maintain consistency with changes made by WAF and CCF. Updated keywords for consistency with WAF and CCF. Added new fingerless models for enchanted lockpicking gloves, dragonscale, elven and glass gauntlets. WAF_FingerlessGauntletsBracers keyword added to all lockpicking enchanted gloves and gauntlets. Animals (chickens, horses, dogs, mudcrabs, etc) will no longer report crimes. Changed minimum pickpocket chance to 1%. This means there will always be a small chance you will succeed, regardless of your skill level. Altered the way the Fortify Pickpocket effect works. This should provide a more streamlined and complete fix for the Fortify Pickpocket bug. Tweaked some of the pickpocket settings to give a bit more weight to the player's skill level and further increase the weight multiplier. In general, the adjustments should make pickpocket chances somewhat higher than they were in previous versions. Updated Armors to carry over changes from Weapons & Armor Fixes and Clothing & Clutter Fixes. Changed names of generic items to reflect muffle enchantment level (i.e. "...of Major Muffling" and "...of Eminent Muffling"). Changed lockpick recipe to use iron instead of steel and added CCO support. By default, the lockpicking & pickpocket gauntlet penalties will now apply only to items that cover the full hand and not bracers or fingerless gloves. Gauntlet penalties now also apply to non-armored gloves. Corrected the Pickpocket gauntlet penalty so it is no longer affected by the Nimble Fingers lockpicking perk. Included changes from "more alert guards" and "fewer lockpicks" in the main file. Items from Immersive Armors will now be automatically compatible with the Camouflage perk. Bracers and gloves added by Immersive Armors that don't fully cover the hands will now be exempt from the lockpicking & pickpocket gauntlet penalties. Uninstall script now adds back the appropriate number of perk points when the mod is uninstalled. Lightfoot is now stacked as an optional second rank on Silent Roll. Lightfoot requirements are now Sneak >= 60 (was 40). Added new perk "Camouflaged" to the Sneak tree (replaces Lightfoot's position). Initial maximum pickpocket chance has been decreased to 75% for a character with no perks. 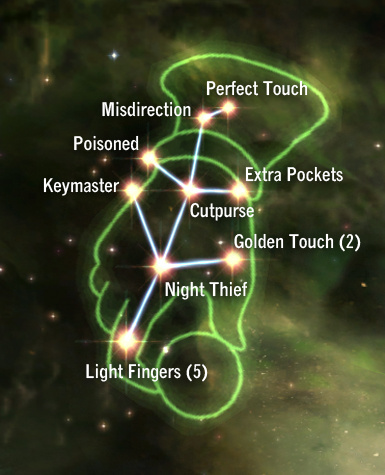 Maximum pickpocket chance now scales with the pickpocket perks (up to 100% with Perfect Touch). Reworked the muffle spell. It now scales more evenly and works more efficiently. Made the ability to disarm ("unlock") traps dependent on the Nimble Fingers perk. Edited the Derelict Locks perk so that it would not apply to traps. Modified the All Access perk so that it changes the lock to a master lock rather than auto opening. Altered the text choices that appear when the All Access perk is used. Changed the Safecracker perk to a bonus for locked containers. Corrected the perk requirements for Extra Pockets. 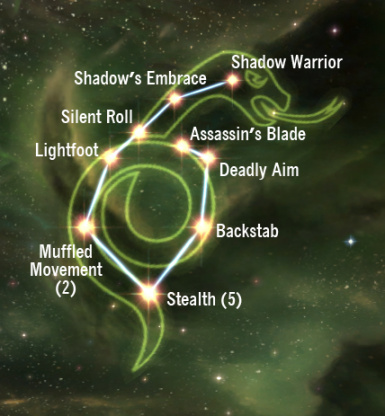 Sneak, lockpicking, and pickpocket should be specialized skills that take some effort and commitment to master, not simple tricks that any sword-swinging warrior stumbling out of Helgen can instantly achieve. 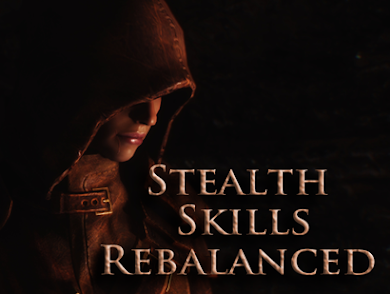 Toward that end, I've created this mod to balance out three of the stealth skills that I felt weren't properly addressed elsewhere. 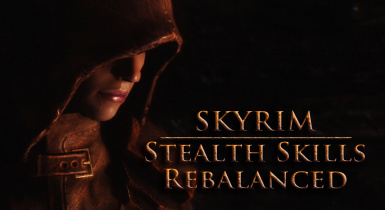 This mod re-balances Skyrim's stealth skills to add greater challenge and immersion to the game. If you play a stealth-based character, this mod will make your game more difficult but also much more rewarding. Animals will no longer serve as witnesses to crimes and will not report crimes. Fixes several perks that overlapped and were made redundant by other abilities; the effects now stack and enhance one another. I play mostly stealth-based characters and was constantly disappointed at how easy these skills were to master in the vanilla game. Despite the type of character I was playing, most of my perks went toward other skills since there seemed to be very little need to waste the perk points on aspects of the game that were already much too easy. There seemed to be no challenge and very little reward to pursuing these specializations. My intention was not to completely remake these skills or fashion them into something entirely different. Rather, my goal was to fine-tune the settings and perks in order to compliment and enhance the original game, while providing a more balanced and rewarding experience for stealth gameplay and stealth character builds. There are two versions of this mod, a “basic” version and a “full” version. The BASIC version attempts to correct the issues with Skyrim's stealth gameplay while remaining as close as possible to the intentions of the vanilla game. In addition to the changes in the Basic version, the FULL version will include any extra features that, while I feel they may enhance these skills, may not be considered in line with the original game. The Full version includes the All Access perk. The Full version includes changes to the Sneak perk tree. The Full version adds the Camouflaged perk to the Sneak tree and makes Lightfoot an optional second rank to Silent Roll. Modular versions are also available so you can choose to install only those portions of the mod you wish to use. Please read the description of changes listed below, so you will understand what this mod does and whether it will conflict with any other mods you have installed. Further customizations can be done via the console. See the Readme file for details. Requires SKSE. Version 1.2 and up require the latest version of SKSE. Before installing this mod, I recommend that you get rid of any items that your character has custom enchanted with the muffle effect. After you install this mod, these items will still retain the broken vanilla value, but the text description will be changed to the new modified value, so having these items in your inventory or storage containers may lead to confusion down the road since their actual muffle value will not be obvious. However, having these items in the game will not create crashes or other serious issues, they will simply be overpowered. If your character is currently wearing the Cursed Ring of Hircine, then wait to install this mod until after you have completed this quest and have removed the ring. Installing this mod while wearing the Cursed Ring could cause a slight problem with this quest. Your perks will update automatically and will be transferred to the modified perks. If you are installing this mod to an existing game (more than a day has passed in-game), then when you first install the mod, a script will run to update your perks and settings. The script will take a few seconds to finish. When it is complete, you will get a message in the upper corner of your screen confirming that perk updates are complete. Your character will be naked once the script is finished. If you are starting a new game or installing the mod to an existing save where less than a day has passed in-game, then this script is not needed and will not run. If you had neither the Muffled Movement or Silence perks, then the value you get should be 1.0. If you have Muffled Movement but not Silence (now Muffled Movement, rank 2), then the value should be 0.75. If you have both perks, the value should be 0.50. If the value is incorrect, first try simply reloading your game from the same save (don't make a new save). If this doesn't correct the value, then there may be another mod interfering with the settings. To update, simply replace the old files with the updated version. If updating from 1.0, the install script will run once again, and your character will again be naked. Unfortunately this was necessary due to updates made to the muffle script. Updating from 1.1 will not re-run this script. You will see a message confirming that the mod can be uninstalled. Click OK and make a new save immediately, then exit from the game and deactivate or delete the mod. Most perks will switch back automatically. However, when uninstalling the mod, certain perks will be lost. When uninstalling Version 1.2 or later, you will be given back the number of perk points equivalent to the perks you'll lose when uninstalling the mod. If you are uninstalling Version 1.1, then you will need to use the console to add perks to your character if you wish to compensate for the lost perk points. The only perks lost through uninstalling are Muffled Movement & Silence (Sneak tree), Golden Touch (Pickpocket tree), and NimbleFingers & DerelictLocks (Lockpicking tree)... all other perks will convert back automatically. There are three main aspects of sneak in Skyrim: sound, light, & skill. 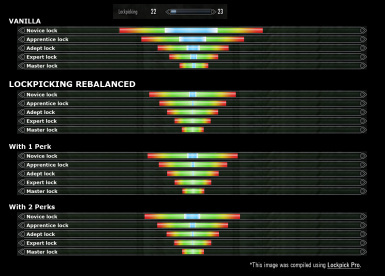 Each of these factors has been tweaked and re-weighted to create a better overall balance. This will make sneaking more difficult and NPC reactions more believable. Armor weight has much more impact on stealth. This means you'll need to watch your weight and avoid heavy armor. Also, the faster you move, the more sound you'll make, so move slowly and carefully. Light also has a much greater effect on your ability to remain undetected. Stay in the shadows and avoid brightly lit areas. Again, moving slowly is key. Also, pay attention to the direction your opponent is facing and stay outside of their line of sight. This was important before, but it's even more critical now. While increased skill is still an important factor, the importance of the player's sneak skill has been decreased relative to sound and light. My goal was to encourage more tactical awareness, at both high and low levels, and to prevent high sneak skills from becoming overpowered at higher levels. Perks are important. You'll almost certainly want to boost your skills with perks and/or enchantments if your character intends to do much sneaking. Detection times have been significantly increased. The detection AI of NPCs should now appear more natural, and NPCs will continue searching for you much longer, especially if they've been attacked. The detection view cone for NPCs has been narrowed to 165 degrees. I found this angle to be the best balance between realism and practical gameplay. Once alerted, an NPC's perception will actually increase, and they will become much more aware of any small sounds or movements. So be careful...once they start looking for you, they'll have a better chance of actually finding you, especially if your character still has a low sneak skill. Guards are more alert and have better detection abilities than they did before. The crime reporting radius for NPCs has also been reduced to a more realistic distance. Animals and creatures will no longer report crimes. Various perks and effects either overlapped or interacted poorly with one another in a way that made other perks, enchantments, or spells entirely redundant. For example, having either the Unhindered or the Conditioning perk would negate any benefit from having Muffled Movement and Silence. So why spend two perks in Sneak when you can get the same effect from a single perk in heavy armor...heavy armor! Or you could choose the Steed Stone and completely negate all four of these perks, as well as making any muffle enchantment (including those on a number of unique armors) completely worthless. Wearing the Ebony Mail, the highest level Nightingale Boots, or several of the other muffle-enchanted items would also break sneak. All of these different effects have been balanced against one another, so that you can now gain additional benefits from each of these perks and abilities. Instead of negating one another, they now enhance each other and can be stacked for greater benefit. I didn't make any drastic changes to the layout or composition of the Sneak tree, but a number of the perks have been adjusted to better balance their effects with the other changes made to sneak. The sneak attack perks have been altered so that they now increase from general application to increasing specialization, building upon one another rather than jumping from one weapon type to another and thereby potentially forcing you to take perks you didn't need in order to get the one you wanted. Backstab - sneak attacks with ALL weapons do half again as much damage (x1.5). This also includes Unarmed sneak attacks. Deadly Aim - sneak attacks with 1-handed weapons & bows do double damage (x2.0). This increases the Backstab multiplier (rather than stacking with it) so that the total damage multiplier will be x6 for 1H and x4 for bows. Assassin's Blade - unchanged (x2.5). Stealth - all 5 ranks now scale up evenly in increments of 10% (i.e. 10-20-30-40-50). Muffled Movement - reduced to 25% and given a 2nd rank for up to 50% muffle. The first rank takes into account the type of armor you're wearing, and deducts 5% for each item of heavy armor (up to 20%, so you'll always get at least 5% muffle from this perk, even in full heavy armor). The 2nd rank grants 25% muffle regardless of what you're wearing. The 2nd rank of Muffled Movement replaces Silence, and if you had Silence prior to installing the mod, you'll now have the 2nd rank of Muffled Movement in it's place. Camouflaged - FULL VERSION ONLY - Wearing four pieces of dark clothing or armor will make you harder to detect at night or when inside. This perk will stack with Shadow's Embrace and works with any combination of dark robes, expert robes, guild armor, shrouded armor, nightingale armor, and various other vanilla items. When you take this perk, you will also be given a ring that will allow items from other mods to be included in this effect (just equip the ring and follow the directions). Lightfoot - FULL VERSION ONLY - Lightfoot has been relocated on the perk tree and is now an optional second rank above Silent Roll. The skill requirement for Lightfoot has been increased to Sneak >= 60. Shadow's Embrace - decreases the relative effect that light has on detection. This seemed only fitting as Muffled Movement affects sound, while Shadow's Embrace and Camouflaged affect light...two different aspects of detection. Unhindered / Conditioning - both of these perks now reduce the weight of armor by 50%. To compensate, these perks now also have a carry weight bonus: Conditioning (+80), Unhindered (+50). The Steed Stone - reduces armor weight by 50%, plus an additional +50 to carry weight (+150 total). This stacks with Unhindered and Conditioning to grant up to ~75% reduced armor weight. The BASIC version of this mod does not actually change the sneak tree; instead, the changes were made to the perks themselves. This means that this version should be compatible with other mods that alter the sneak perk tree as long as they don't touch the same perks. Mods like Armor Disguises, which add new perks without changing the old ones, should be compatible (such mods may or may not be properly balanced for use with this mod, but that's a different issue). The FULL version, however, does make changes to the sneak tree and will not be 100% compatible with these mods (though if the other mod does not depend on using the Sneak tree, then they will likely still work together). While this is a valid effect, the values used were often wildly inconsistent and, in general, much too high. When combined it made this effect incredibly overpowered, and in certain forms pretty much eliminated any need to move stealthily. Also the exact values weren't apparent during regular gameplay, which made it impossible to determine the relative effectiveness of an item or spell except through trial and error. As mentioned above, the Muffled Movement and Silence perks have been reworked, but I also adjusted the values for nearly every muffle effect in the game and made it so that, in almost all cases, the exact value of the muffle effect is displayed in the item description. I've also managed to correct the way the muffle effect was being applied to custom enchantments, so that custom enchantments are no longer broken (however, this fix does not apply retroactively). New light armor and unarmored Boots of Muffling have been added to the game (Dragonscale, Elven, Hide, Imperial, Iron, Leather, and Scaled). In addition, there are three versions of the Leather, Hide, and cloth boots with 20%, 25%, or 30% muffle. All of the new boots have been added into the appropriate leveled lists. *Changed enchantment values, not armor, so any changes made to the armor by another mod will still be compatible. You can disenchant most of the generic boots of muffling. I've corrected the value for the custom enchantment so that the game no longer erroneously applies 100% muffle to any custom enchantment. Now the value of any custom enchanted muffle effect will be 25% muffle. This will work even if you have already learned the muffle enchantment prior to installing this mod. HOWEVER, all items that have been custom enchanted with a muffle effect before installing this mod will still retain their vanilla values (even though the description on these items will change to 20% muffle, this will be inaccurate). I strongly recommend you discard all items custom enchanted with muffle before you install this mod. Muffle scrolls remain unchanged. Scrolls grant 100% muffle, but are balanced balanced by cost, rarity, and limited duration. The Muffle spell now scales with your Illusion skill. The Muffle spell will grant a muffle effect equal to ½ of your current Illusion skill level. So a character with an Illusion skill of 40 will receive a 20% muffle effect. If you have the Kindred Mage perk, then the Muffle effect will be equal to your Illusion skill level (i.e. 40% muffle at level 40). Dual-casting muffle will increase the duration of the spell, but will not increase the magnitude of the effect. 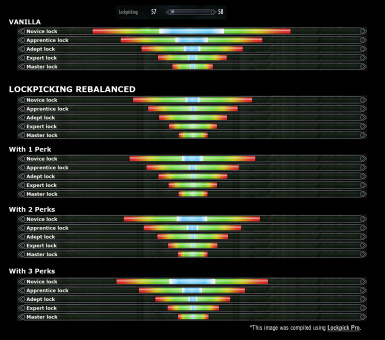 As you can see, there are multiple ways to stack perks and enchantments to gain significant advantage in sneak. It is still possible to get over 100% muffle by stacking various items or effects. And while I still believe that 100% muffle is overpowered, I feel that it's now balanced by the fact that it's only achievable with conscious effort and trade-offs in other areas. Lockpicking is now a specialized skill that will require some investment before you'll be able to unlock high-level locks. A low-level character without perks should be able to pick Novice and Apprentice locks without too much trouble (and if you're lucky, possibly Adept). Even at higher skill levels, you'll want at least a couple of perks before attempting master locks. 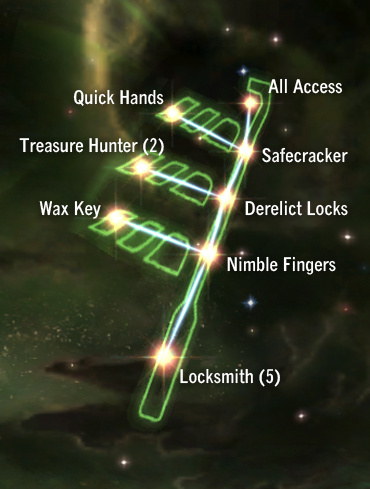 Lock sweetspots for all locks have been significantly reduced, and there is a much greater difference between the lock levels (perks will help to smooth out this difference). Gauntlet penalty - Until you've taken the relevant perk, you'll receive a lockpicking penalty for wearing gloves or gauntlets. However, bracers and fingerless gloves do not receive the penalty. Stronger lockpicks - lockpicks don't break quite as easily, and all lockpicks now have the same strength, no matter what type of lock it is. This gives you the feeling of being able to jimmy the lock, and I think that it is much more satisfying than having lockpicks snapping as if they were made of glass. Fewer lockpicks - lockpicks have been removed from many of the merchants and leveled lists in the game, making lockpicks rarer and increasing the value of the Wax Key perk (which allow you to craft lockpicks). This has been done selectively, for example: Fences will still sell lockpicks, but general merchants will not. Bandits will still occasionally have lockpicks, but draugr and dwemer automatons will not. 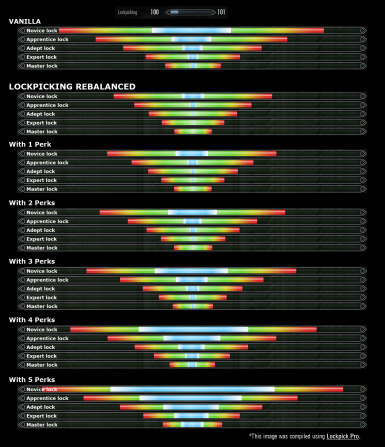 Lockpick strength will also continue to scale significantly as your skill in lockpicking increases. New gloves (clothing) with leveled Fortify Lockpicking enchantments have been added to leveled lists and vendors. There's a chance that you'll find jewelry with higher-level fortify lockpicking enchantments earlier in the game. I've reorganized the Lockpicking tree in a way that I felt made more sense and gives the player a greater choice in the order in which they can choose to take the perks. I think the changes make the tree more flexible and allows it to scale better with the player's level. Locksmith - all of the skill increase perks have now been collapsed into a single perk with 5 ranks. Each rank affects all locks. You will almost certainly need at least 1 or 2 ranks before you will be able to open master locks. Nimble Fingers - removes the lockpicking penalty for wearing gloves and gauntlets. Also grants the player the ability to disarm traps (you can no longer “unlock” traps without this perk). Derelict Locks - provides a significant bonus to any locks not located near civilization (dungeons, wilderness, etc.). This perk is very useful, particularly for those playing a non-criminal character. It does not, however, apply to traps. Treasure Hunter - first rank was previously Golden Touch. Second rank has the same effect as the original Treasure Hunter perk, but instead of increasing your chances to find better loot by 50%, it now doubles your chances. Safecracker - provides a bonus when unlocking any type of container. Quick Hands - same effect. I felt this ability was more suited to a higher-level perk and have arranged it as such. All Access - FULL VERSION ONLY - replaces Unbreakable, though it still retains Unbreakable's effects. In addition, it now also allows the player to open “Key Required” locks, thereby opening up new routes for stealthy characters to complete dungeons and, in some cases, quests. Once you take this perk, activating a Key Required lock will cause a message box to appear with the options to “Unlock Only with Key” or “Pick Lock.” Choosing “Pick Lock” will convert the lock into an ordinary Master lock that can be picked. Choosing “Unlock Only with Key” will ONLY open the door if the player has the appropriate key. For me there was really only one ability that truly felt worthy of being considered a master lockpicking perk...the ability to open every lock in the game. I've always hated having my master thief forced to run the long way through dungeons or kill a particular enemy just in order to obtain a key to a chest or door that my character's lockpicking skill should have allowed them to easily pick. All Access allows you to do this, but it's not without risk, so please take a moment to read the description and understand what this perk does. If you're not comfortable with this perk, there is a version of this mod that doesn't include it. It is possible to break quests if you use this perk irresponsibly. Carefully consider what you're unlocking, and if you're uncertain about a lock, then make a save before opening it so that if there is a quest object inside the chest or behind the door, then you can reload. This perk works similar to the Tower Stone, so when you activate a Key Required lock, a message box will appear and you will have to confirm that you do indeed want to open the lock. Keep in mind that the game designers never intended the player to have the ability to open Key Required locks, so while All Access can be a fun and quite useful perk, you cannot take it lightly. You have been warned, and I take no responsibility for any issues caused by using this ability unwisely. If you don't think you have enough knowledge of the game (if it's your first play-through or if it's a quest or dungeon you haven't encountered before in previous play-throughs) or you just don't want to take the risk, then simply avoid using the perk. It's not required for anything else, and you're given a heads-up every time you do try to use it. So stop and think for a moment about what you're doing. As a skill, pickpocket certainly has it's share of issues. It's ridiculously quick to level up, and if you spend much time on this skill, it can potentially handicap your player by advancing the game level too rapidly. This mod will make pickpocketing more challenging and more difficult to fully max out your success chance without the assistance of perks and/or enchantments. In addition to making pickpocketing more difficult, I've also managed to correct the vanilla bug that would cause pickpocket chances to decrease when using any fortify pickpocket enchantments or potions (you may still encounter this bug in some circumstances, as explained below). Pickpocket skill now has less relative effect on your chances of success. An NPC's skill now has a greater effect on whether you can successfully pickpocket them. Item value has much less effect on pickpocketing chances. This also means you can now pickpocket items of much greater value than you could before (previously it was impossible to pickpocket items worth over ~1,500 gold). Item weight now has a much greater impact on pickpocketing chances. The initial Maximum pickpocket chance has been decreased to 75%. The maximum chance will now increase with certain perks, up to 100% with Perfect Touch. Like Lockpicking, the player will now receive a penalty for wearing gloves or gauntlets prior to taking the Cutpurse perk. Bracers and fingerless gloves do not receive the penalty. Light Fingers - values have all been reduced for better balance. The first Light Fingers perk will increase the max pickpocket chance to 80%. Keymaster - position and skill requirement was swapped with Poisoned since this perk has more value at lower levels. Night Thief - in addition to vanilla effect, also increases max pickpocket chance to 85%. Cutpurse - in addition to vanilla effect, it also removes the gauntlet penalty while pickpocketing and increases max pickpocket chance to 90%. Golden Touch - a new addition to the Pickpocket tree, this perk has two ranks and works similar to the Treasure Hunter perk in Lockpicking. Misdirection - in addition to vanilla effect, also increases max pickpocket chance to 95%. Perfect Touch - in addition to vanilla effect, also increases max pickpocket chance to 100%. The vanilla Fortify Pickpocket is a broken effect. In the vanilla game, it was not unusual for a Fortify Pickpocket enchantment to actually decrease your chances of success. This is due to the way the formula works to determine pickpocketing odds and is not something that can be fixed within the effect itself. This mod changes the Fortify Pickpocket effect into an actual "fortify skill" effect. This means that the effect will now work consistently for all instances of the effect. This fix should also apply to any new Fortify Pickpocket items added by other mods. All Fortify Pickpocket potions and enchantments are no longer susceptible to the vanilla bug. This applies to all rings, necklaces, bracers, and gauntlets of “Deft Hands” as well as to the Thieves Guild and Guild Master boots. Due to the way that I've altered the settings, the fortify effect no longer applies a direct 1:1 increase in your % chance of success. Instead, it will boost your pickpocket skill, which generally means that your chance of success will increase by about half of the increased skill amount. Therefore, a 20% potion will provide about a 10% increase in your chance to succeed. I've also removed “feet” from the possible enchantment slots to maintain better balance. Thank you to Teabag86 for his help with this file and for doing most of the work for the Version 1.5 update. Thank you to theincrediblenick for the Fingerless Gauntlet meshes from his mod Fingerless Gloves. Thank you to mitchalek for very generously allowing his scripts from Auto Unequip Ammo to be used as a learning resource. I used these scripts to help develop the script that allows customization of the Camouflage perk. Thank you to Grace Darkling for the beautiful screenshot used in the title image. Thank you to Kenney for his Lockpick Pro mod. It was an invaluable tool for creating this mod and was also used to create the comparison images. I have tried very hard to maintain a high degree of compatibility with other mods; however, this mod does make a significant number of changes, and some incompatibilities are simply unavoidable. In general, this mod will likely be incompatible with other mods that alter the game settings that affect stealth detection, lockpicking, and pickpocket. Any mods that make changes to the Sneak (if using the Full version), Lockpicking, and Pickpocket perk trees will also be at least partially incompatible, though in many cases they can still be used together with work-arounds such as console commands (some mods also offer built-in alternatives). Mods that alter the Sneak tree should be compatible with the Basic version. In most cases, they should probably be loaded before Stealth Skills Rebalanced. Items added by other mods can be made automatically compatible with the Camouflage Perk by adding the WAF_VisuallyDarkArmor_KRY keyword to the item. This can be done without making Stealth Skills Rebalanced a master file. Bracers or fingerless gauntlets and gloves that are added by other mods can be made exempt from the gauntlet penalties by adding the WAF_FingerlessGauntletsBracers_KRY keyword to the item. This can be done without making Stealth Skills Rebalanced a master file. 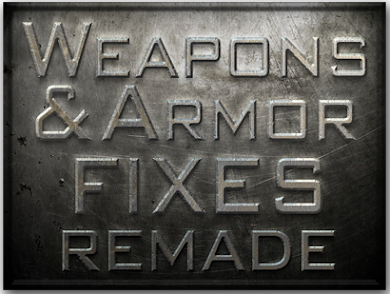 If using Weapons & Armor Fixes and/or Clothing & Clutter Fixes, these keywords will be applied to all appropriate vanilla and DLC items. Likewise, items added by Immersive Armors have these keywords and are automatically compatible with these features. I use and enjoy the following mods, and I believe they compliment this mod very well. Traps Make Noise - triggering traps will alert enemies. This is highly recommended for more immersive stealth experience. In addition, it gives the Nimble Fingers and Lightfoot perks greater significance. Unlock Spell - if you like the immersion of more difficult locks, but you play a mage (or you just prefer to have an alternate option), then I highly recommend this mod. It has the best implementation of an unlock spell that I've seen.